Yes, but do you have b-roll sequences? That is the question. Shooting individual b-roll shots is pretty easy. You just set up the camera, point it at something and hit the record button. Then move to another spot, point the camera at something else and hit record. Lather, rinse, repeat. It doesn’t take much thinking or creativity, and you’ll be finished in minutes. The problem is that your b-roll won’t really help you tell a story, not in any meaningful way at least. Your shots probably won’t capture important details. And you certainly won’t have shots that can be edited into a logical sequence. The solution, of course, is to think sequentially before and during production. No shot is an island. Each shot is one shot within a sequence of shots. And an effective news story contains multiple b-roll sequences, just like a good movie contains dozens of compelling scenes that are skillfully edited together. Planning sequences: You need to plan b-roll sequences before you pick up the camera. Do it when you’re writing the pitch for an enterprise story. Think about all the scenes you’ll need to make the story visually compelling. Make a shot list or a compose a storyboard. 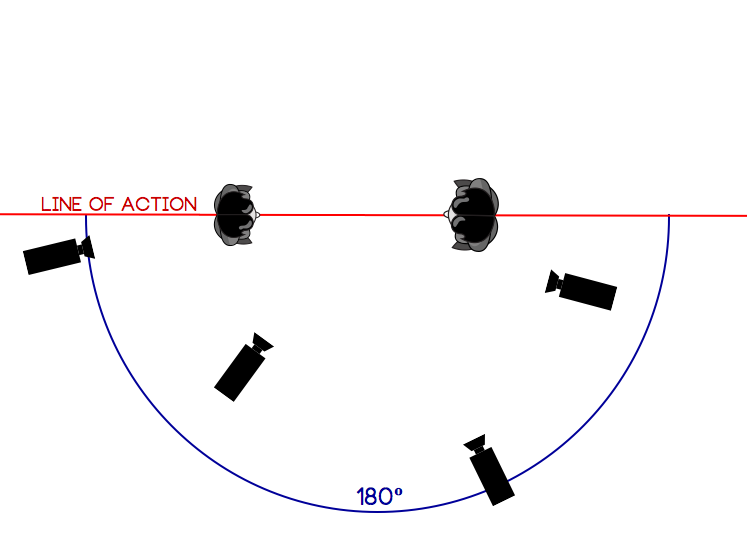 If you’re running out to cover breaking news or spot news, visualize possible shot sequences on the way to the location. Once there, you’ll have to record your shots quickly as the action happens, reacting to events and anticipating what will happen next. So find out as much as you can about the location (indoors or outdoors); the time of day when the action is taking place; the people involved (how many and what will they be doing); and finally, the tools, props and other objects that will be used at the location. Planning even further, you also need to know exactly what kind of action will be happening. Will the people be performing a variety of tasks? Will they be moving from one place to another? Will they be mostly stationary and repeating the same movements over and over again? Or will the location be unpopulated? What if it’s a quiet spot in the woods? With this in mind, let’s take a closer look at a few basic rules for shooting b-roll sequences. Rule 1. Shoot wide – medium – close-up, close-up, close-up, etc. A sequence needs at least one good establishing shot, maybe a few medium shots and lots of close-ups. Each close-up shot captures a key detail within the scene. These shots help connect the audience to the characters and locations in the story. So don’t waste time shooting dozens of wide shots. Get what you need and then concentrate on medium shots and close-ups. If you want to quantify this, I’d say that 75% of your raw b-roll should be close-up shots. And that means close-ups from different angles and positions. Here’s an example from a static location. It’s just a fountain in a quiet park. It’s not an action scene, but we still need variety. The sequence is a bunch of raw b-roll shots edited together with natural sound. Count the number of close-ups compared to wide and medium shots. Notice the different angles, too. Rule 2. Shoot repetitive motion from multiple angles: You have to be fast on your feet to shoot action sequences effectively. It will help immensely if the story involves someone repeating the same movement over and over again (chopping vegetables, playing a musical instrument, packing a box, typing on a computer, etc.). Combine this with Rule 1 so you can get wide, medium and close-up shots of the same movement. Change the camera position and angle and repeat the process. The point is to let the audience see the action from different positions and angles. Remember, you want to take the audience into the story. You’ll do that if you shoot action sequences effectively. Rule 3. Don’t cross the line (aka the 180-degree rule): This really goes hand-in-hand with Rule 2. It refers to the spatial relationship between a character and an object or another character. It’s really all about the geography of the scene. You need to keep screen direction consistent. The “line” that you don’t want to cross runs through the character(s) and divides the space in which you’re shooting. Here’s an overhead diagram with the line of action dividing the location. If a character is facing right in the wide shot, then he or she needs to be facing right in the medium and close-up shots. Once you put the camera on one side of the character, stick with that side. You can move the camera to any position within a 180-degree arc as long as you stay on your side of the line. That’s a lot of room to get a variety of shots. This sequence shows a street busker playing his fiddle at the Pike Street Public Market in Seattle, Washington. Notice that camera stays on one side of the line and still captures the action from a variety of angles. There’s also repetitive action and lots of close-ups, so Rule 1 and Rule 2 are also being applied. Rule 4. Into the frame, out of the frame: You often need transition shots to make a b-roll sequence work. Let’s say a chef has chopped the vegetables and is now ready to cook them on a stove. It’ll help if you have a close-up shot where the chef’s hands (and entire body) move out of the frame as she finishes chopping the veggies. You could also get a shot of the chef moving into the frame near the stove. Or a close-up of the chef’s hand moving into the frame to turn on the burner. If you have these shots, you can get the chef from point A (chopping board) to point B (stove) without a messy jump cut. You have to think quickly while you’re shooting and be prepared to let the character leave the frame and enter the frame at key points. Here’s an example where the character (a librarian) has to deliver books from the library to an elementary school. The challenge is to shoot and edit a sequence that get’s her from point A to point B. This video is just a short segment from a longer story about the library. There’s another great example of this rule in the video of Professor Hazinski going from his office to the classroom. Let’s watch a great example of b-roll sequences in this feature story from ABC News. It’s about a race car engineer named Richie Parker. Pay close attention to the opening shot sequence. The videographer and editor use it to get the character from point A to point B and establish his daily routine. There are lots of other great shot sequences in the story that take us into the character’s life. Final Thoughts: Shooting b-roll sequences for news stories is challenging. You need to have good technical skills with your camera, be able to anticipate action and have a good eye for detail. When planning each story, stop to think about the kind of b-roll sequences that would make the story more visually compelling. Map them out before you start shooting the story, but don’t be afraid to improvise when events or locations change at the last minute. You’ve got to be quick on your feet in this business. Good planning, plus the ability to improvise, makes for good stories.